Ever wondered why some events at the Center for Global Development are large, drawing more than 200 members of the development community, while others are small and invitation only? Been disappointed to discover that a crucial CGD event is full and you are stuck on the waiting list? Maybe you've wondered: "Why can't they fit in just one more?" In the spirit of transparency, we are pleased to unveil today our new and improved method for meeting planning. CGD events manager Heather Haines realized recently that with more than 100 events per year, and hundreds of internal meetings, better meeting management was crucial to enhancing the Center's impact. So she worked with our web technology manager, Steve Perlow, to create a custom iPhone app to track the opportunity cost of our meetings. After extensive internal testing, we are proud to release today the CGD Meet-N-Meter iPhone app. 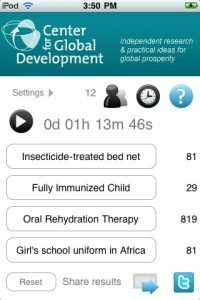 Although the algorithms are complex, the basic idea is simple: Meet-N-Meter tallies the person-hour cost of each meeting and converts the dollars into development-related items, such as insecticide-treated bed nets, vaccines, and school uniforms. Knowing the number of attendees and the average salary at each education level, Heather can use Meet-N-Meter to quickly calculate the cost of any meeting before it starts. Or she can set the built-in Meet-N-Meter timer running and watch the costs mount as the hours rush by. Since we already register our guests when they arrive at events, gathering the additional data will be easy: starting today we will ask attendees to tell us their level of education (Bachelor or Advanced Degree). Recognizing that meetings are costly and development dollars are scarce, we plan to establish a target development impact for all events, large and small. Before Heather approves any event, she will compare the anticipated impact to the anticipated cost and make a ruling. For example, during the pilot stage, the State Department approached us to host Secretary Clinton's speech on Development in the 21st Century. We quickly ran the numbers to make sure the speech would be in the world's best interest. The Meet-N-Meter has already garnered significant praise. CGD President Nancy Birdsall fully supports the method and says that it falls squarely within CGD's mission to improve the efficiency of moving ideas to action. Susie Wastalot from the Institute for Meeting Management says, "I believe that the Center for Global Development's work in this area is cutting edge and encourage other think tanks to follow suit. I have nominated Ms. Haines and Mr. Perlow for induction into our Meeting Management Hall of Fame." Perhaps most exciting are the rumors among iPhone app developers that Steve Jobs recently downloaded the Meet-N-Meter and is planning to require its use at all Apple meetings. Unfortunately efforts to reach Jobs for comment were unsuccessful. His assistant said that Jobs' schedule today was completely booked with meetings.